Gardening, Lawn, and Landscape → Gardening → Growing Orchids: Easier Than You Think! 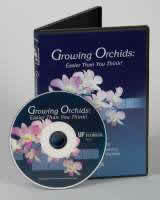 Shot on location at the beautiful American Orchid Society Visitors Center and Botanical Garden in Delray Beach, Florida, this DVD dispels the myth that orchids are difficult to grow. Tom Sheehan and Bob Black, authors of Orchids to Know and Grow, use hands-on demonstrations to discuss easy-to-grow orchid varieties; selecting appropriate containers, planting medium, and fertilizers; watering requirements; and many more tips for caring for your orchids. 60 minutes.